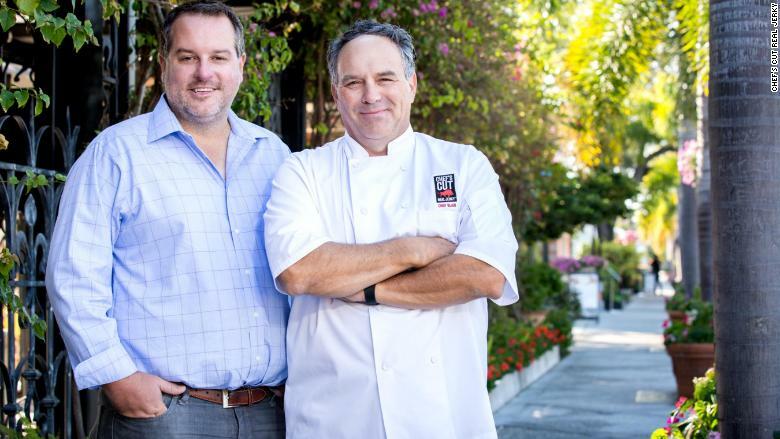 Chef's Cut Real Jerky co-founders Dennis Riedel, left, and Blair Swiler. When Blair Swiler quit his 25-year career as a chef for health reasons, he couldn't bring himself to leave the kitchen altogether. He started making jerky to take to a golf club in Naples, Florida, where he worked as a caddy. "Jerky became a passion that I just made for me and friends," Swiler, a 59-year-old Wisconsinite, told CNNMoney. One of those friends was Dennis Riedel, a caddy from Michigan. "Blair was snacking on something, so I asked to try it. It completely changed what I thought jerky was," Riedel, 38, told CNNMoney. "It was tender, easy to eat and completely different to the rock-hard stuff I was used to." 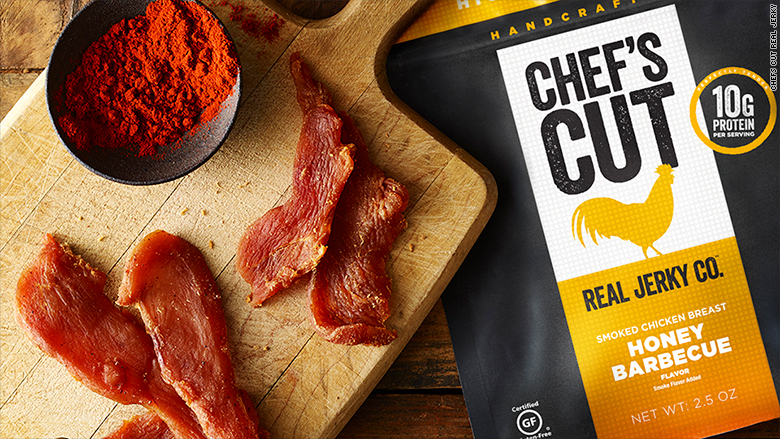 In 2009, Riedel and Swiler founded the business now known as Chef's Cut Real Jerky. Today, their products are available at more than 800 golf clubs and 40,000 other retail locations across the United States. The company says it made $48 million in revenue last year. Swiler and Riedel's business took off at the Bayonne Golf Club in New Jersey, where they started making jerky in the club kitchen and selling it on site. Riedel was spending winters in Florida and summers in New Jersey. After the Bayonne club agreed to let them use its facilities, Swiler moved there to caddy and make jerky. The products are now sold at golf clubs and retailers across the United States. "Members loved it," Riedel said. "We quickly expanded to other premier golf clubs around the country." Jerky proved popular on the golf course because it travels well and is high in protein but low in fat and sugar. The company is now has 30 employees. It's based in New York City and owns smokehouses in Idaho, Michigan, Illinois and California. Chef's Cut has attracted a number of high-profile investors, including baseball player David Ortiz and actress Olivia Munn. Initially, Chef's Cut had four varieties, including Swiler's original recipe for steak jerky marinated in homemade soy sauce, horseradish and Worcestershire. Today, the brand sells jerky in eight flavors, plus meat sticks, meat bars and protein snacks. The meats are sourced domestically and never frozen, and Swiler is behind every recipe. The company is now looking to grow further in the United States. "Ten years ago, if I told you jerky was going to be the go-to snack at some of the most prestigious golf courses in the country, you wouldn't have believed me," Riedel said.